Matt Carthum has been working in the design realm for the past 15 years crafting and leading experiences for Alaska Airlines, Janus Capital Group, Bill Gates, SAP, Microsoft and many others. He is a Product Design Manager for Disney Parks & Resorts Digital. 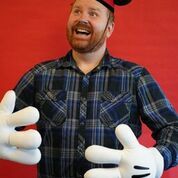 During his 5 years, he led the design for Shop Disney Parks, various commerce experiences for mobile app and web and now focuses solely on holistic experiences on the Disney Parks and Resorts mobile apps.